Two-time NWAC All-Star defender Sterling Penniston-John signs a national letter of intent, Tuesday February 26th, to continue his collegiate soccer career at Division I Utah Valley State. Please check out a LIVE STREAM of our home matches on YouTube, by searching Peninsula College. PORT ANGELES – Cesar Gervacio repeated as North Region Most Valuable Player and seven of his Pirate teammates were honored as the Northwest Athletic Conference announced its All-Star and All-Conference selections Tuesday. Gervacio, a sophomore from San Jose California, who led the NWAC in scoring through the regular season, was named MVP for the second straight year, as well as an All-Star forward. Joining him on the list of All-Star forwards is fellow San Jose native Juan Carrillo, also a sophomore. Peninsula’s Adrian Benitez, a sophomore from Riverbank, California, and Jose Serna, a freshman from Cowiche, Washington, were named All-Star midfielders, and freshman Sterling Penniston-John of Las Vegas, Nevada was named as an All-Star defender. The five Pirate All-Stars will play in the NWAC’s annual All-Star Game at the Starfire Sports Complex in Tukwila at 11:15 on Sunday. Earning All-Conference recognition for the Pirates were Joey Hollimon, a sophomore from Las Vegas; Sergio Gonzalez Reyes, a sophomore from Reno; and Michael Benito, a freshman from San Diego. PORT ANGELES – For the second straight year, injuries played a hand in an early exit for one of the top junior college soccer programs in the NWAC – and the nation. The Pirates, playing without three starters, fell to Walla Walla 1-0 Wednesday in the first round of the NWAC playoffs. Peninsula finished 10-1-4 in North Region play and 12-3-4 overall. They were ranked No. 4 in the NWAC and as high as No. 10 amongst the nation’s junior college men’s soccer programs. Going into Wednesday’s playoff against eighth-ranked Walla Walla, the Pirates were without Cesar Gervacio, the NWAC’s leading scorer, Adrian Benitez, who is second in assists in the NWAC, and Noah Scofield, a starting midfielder, all three players sidelined with injuries. Despite that shortcoming, the Pirates outshot Walla Walla 19-3, but simply could not find the net against a defensive-minded Warrior team. The Walla Walla men scored in the 31st minute for the only goal of the match. Sadly, it was a repeat of Peninsula's 2016 season-ending loss in a playoff that also saw the Pirates without Gervacio and a handful of other starters. 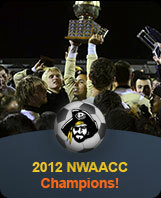 Following that quarterfinal overtime setback to Tacoma, the Titans went on to win the NWAC. Peninsula will graduate six sophomores in Gervacio, Benitez, Juan Carrillo-Perez, Michael Day, Sergio Gonzalez Reyes, and Joey Hollimon. “It’s been an honor to coach these young men for two years,” Hughes said. “Joey Hollimon is a young man I could turn to and depend on. His growth as a person and player is recognized in his 12 goals and 5 assists,” Hughes said. “Sergio Gonzalez-Reyes, along with Joey, were our team captains. Sergio was our rock. He was consistent and did not miss a minute. Sergio leads by example and his teammates care deeply for him. He brings values that go behind the soccer field,” Hughes said. “Adrian Benitez, is a talented and dedicated player who works extremely hard in training and in games. 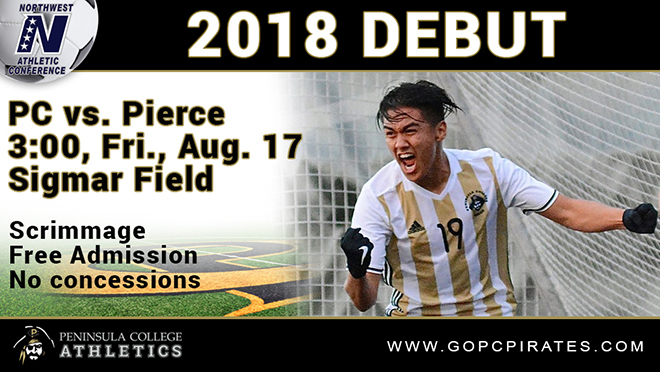 His ability to pick the right pass and link play is evident in his 9 assists and 2 goals. He has been a pleasure to coach and be around. Adrian was extremely unlucky to pick up a knee injury during our training session before our first playoff game,” Hughes said. “Cesar Gervacio, was also unlucky to pick up a hamstring injury during our game against Edmonds. He had a truly special season tallying 18 goals and five assists. Cesar has the ability to link play, hold the ball, and get goals,” Hughes said. “Juan Carrillo brings a spark to our offense. He scored 15 goals and six assists and played almost every game,” Hughes said. “Michael Day scored arguably the best goal of our season against Edmonds. He has the ability to defend and get forward and attack. Michael has grown, and continues to grow into a good young man,” Hughes said.